A legendary Jungian analyst shares wisdom for finding new layers of your life’s purpose. Renowned as one of the most influential and visionary analysts of his generation, Robert A. Johnson follows in the tradition of Joseph Campbell and Carl Jung among those whose ideas have shaped our deepest metaphors of self and psyche in the past 100 years. On The Golden World, you are invited to join one of our wisest elders for a candid and unforgettable discussion about the experiences and spiritual epiphanies that changed his life, and how those moments inform the work that has made his legacy. 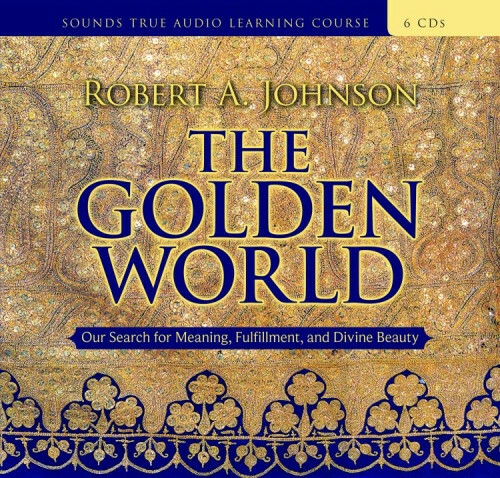 Quest for the "Golden World"
In this intimate audio encounter with a living legend, Robert Johnson shares his fascinating memories of the defining moments of his 86 years as a spiritual seeker. From a childhood near-death experience to the chance encounter that led him to first explore Jungian study, Johnson illustrates the essential concepts that have become the cornerstones of his acclaimed work. At the center of this "personal mandala" is what he calls the quest for the "Golden World"—a lifelong search for a sublime state of enlightenment that resides within each one of us. The tantalizing "preview of heaven" that sparks so many seekers, and much more. The Golden World is an unprecedented opportunity to sit side-by-side with a living legend as he reflects upon his own quest—and provides you a personal glimpse of the cartography of the human spirit and one man's timeless wisdom for finding new layers of your life's purpose. I have just come across Robert A Johnson Sounds True.. I have listened on MP3 Player & will no doubt include it on my Daily Meditation. Love & Blessings & continued success in touching the hearts & souls of those in need.